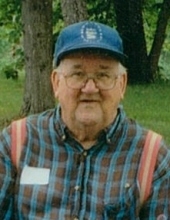 PITTSFIELD-Clifford A. Raye, 89, known as “Kit” to his family and friends, died peacefully on Monday, January 14, 2019, in Bangor. Kit was employed in the area shoe shops and retired in 1992. He enjoyed fishing, hunting, baseball, sports and watching his favorite westerns on T.V., especially Gunsmoke and Bonanza. He was an avid Red Sox fan and watched every game…sometimes twice! He was a member of the Burns W. Knowlton American Legion Post 32 in Pittsfield. He is survived by his son, Randy Raye of Palmyra; his granddaughter, Audrey Raye of Bangor; two brothers, Merle “Moe” Raye of Vanceboro and Max Raye and his wife Cynthia of Bangor and Florida. To send flowers or a remembrance gift to the family of Clifford A. Raye, please visit our Tribute Store. "Email Address" would like to share the life celebration of Clifford A. Raye. Click on the "link" to go to share a favorite memory or leave a condolence message for the family.